You’ll notice, I think, that I never do tutorials anymore on my blog. Why? It’s not only because I’m lazy and not an expert. But, in this current blogging environment, I have neither the time, energy or temperament to set myself up for comments about not knowing what I’m doing. Y’all. I sew for fun. I leave the tutes to those with brass balls and skills. But, I’m not above demo-ing a trick or two. If there is one thing I dislike doing, it’s gathering material using two rows of stitching. 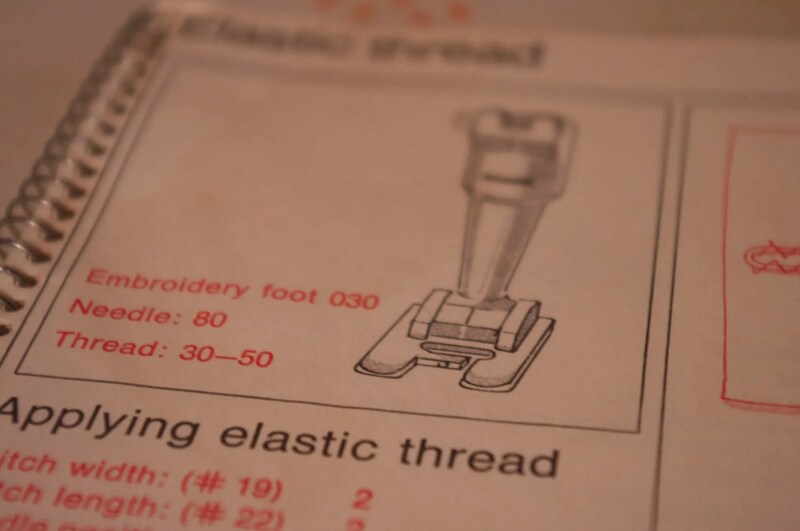 My Bernina 830 came with several feet, including this 030 embroidery foot (now sold as #6 both old and new style methinks). The foot comes with an hole in it and according to my manual, can be used for gathering. How’s that? 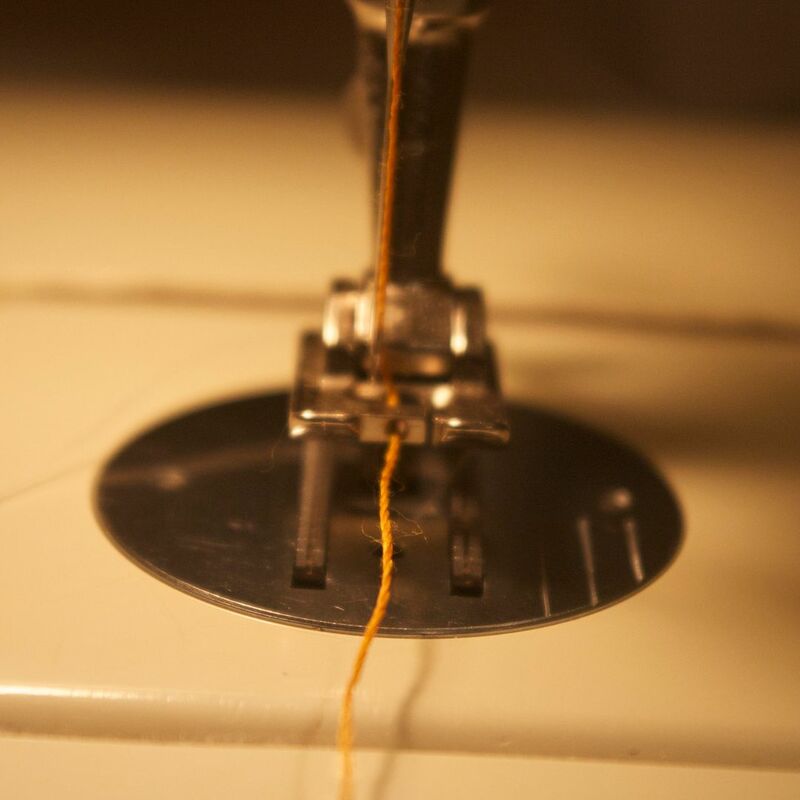 Using a thicker piece of thread (I used jeans top stitching thread) you are able to zig zag over the thread. 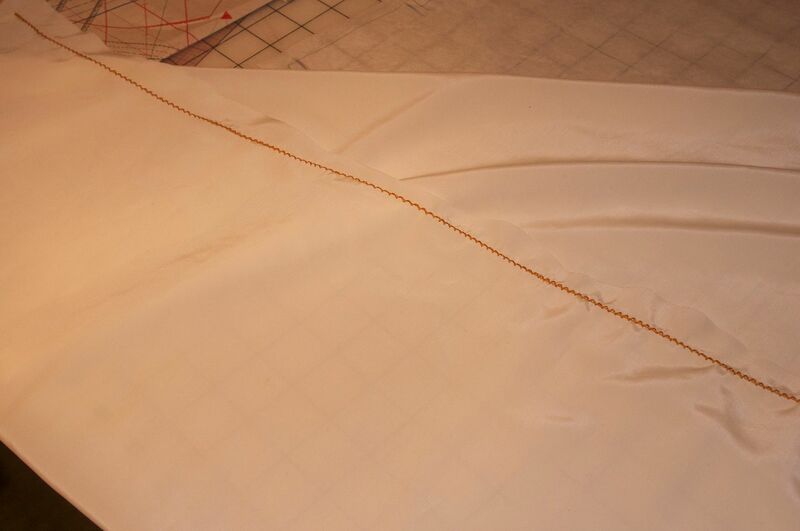 Then you pull the long straight thread and the fabric gathers. I realize that Christina told me years ago I could do this with yard or elastic thread. But, I never bothered until now. The foot is nice because I don’t really have to focus too hard on not hitting my main thread with the needle while zig zagging. So, I realize the Bernina feet are crazy expensive compared to low shank feet. But, there really are some nice features they have that can make your sewing easier. Plus, I’m all about specialized gadgets and driving European cars. I’m pretty sure there’s a good analogy in there somewhere. 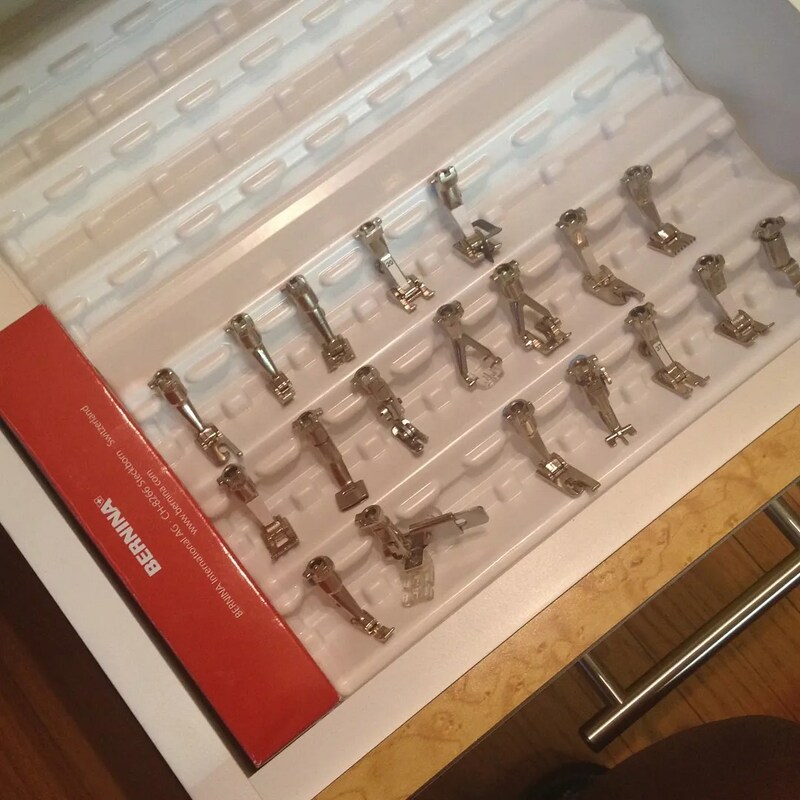 This awesome drawer insert holds my Bernina feet. You can purchase one here. NAYY. Just love the simple solution. This weekend I also picked up the Bernina invisible zipper foot. It was the foot-of-the-month foot last month. Which made it 25% off the price. I’ve heard really good things about this foot. And, hope it lives up to the hype. I’ll definitely do a little post to compare how it works next week. I was taught to do this with gimp which works well but you have to pull it to distribute the gathers. I also like gathering with my gathering foot which I got with my 931 Bernina. I used it a lot when I was making little girl clothes. You have to work with stitch length to get just the right amount gathering but it works wonderfully well and is so easy. Gimp is just a heavy, strong thread. Nothing mysterious! Don’t be afraid of your gathering foot. You hold your finger behind it as you stitch, allowing the fabric to sort of bunch up to form gathers. Very easy. I can’t for the life of me figure out how it works but it does. Give it a try…Bernina’s got your back! Huh. To me, gimp is a specific sort of woven braid, that is used extensively in the manufacture of upholstered furniture. Gimp gets glued down over the staples that hold fabric onto a frame. Also used a lot by costumers who are replicating 19th century women’s tailored suits. I’ve recently started looking at the other feet in my Bernina feet box (I’ve had the machine since 1994!) so I’m excited to see you’ve done the legwork for me on the #6. I’ve had the invisible zipper foot for years after wrestling with the plastic cheapo one with the shank adapter and it’s soooo much better. It does take practice to make it look good, but that’s with any thing. P.s. Adore the new blog template! I just use cotton crochet thread and zig/zag over it. Has helped my frustration levels greatly over the years. Two rows of stitching, bah humbug! Thanks for sharing this, I too hate those two lines of stitches for gathering! I don’t do tutes on my blog either. 1. Sewing is fun and this is my personal space to journal about it. 2. No time to answer yahoopeople questions from yahoosew-ers who can’t get their “just try it” mojo on. 3. Annoyance at commercial-minded bloggers who ‘copyright’ their “How to Thread Your Sewing Machine Needle” tutorials. Really. 4. I leave tutorials for bloggers with brass balls. Another idea for that jeans thread/gimp. I was taught to do buttonholes this way. 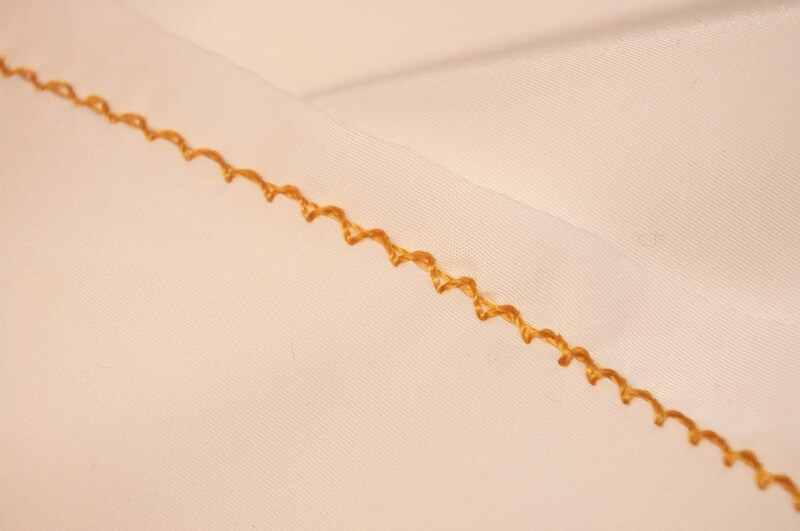 The thread underneath the zigzag buttonhole stitches is tied off and strengthens/stabilizes the buttonhole. I learned to evenly distribute gathers using pin basting, years ago. I’d rather pin and sew over and un-pin any day, than futz about with threads and pulling and all the frustration that involves. So glad you’ve found a quicker solution to this seemingly-endless task. This is the same method I use as well. I normally just use whatever thick string I can find around me. About doing tutorials, it really is a lot of hard work. A great solution to a very boring job. And isn’t it just so annoying when a thread breaks as you are pulling the gathers up? Grrr. Nifty! I dread that two-lines of stitching type gathering too, and I thought that it was “just me.” I’ll give this method a try — thanks! You all are in “Good Company” and I’m joining you with the gathering with two lines of stitching! This is such a neat tip and wish I had a Bernina! Maybe that a “hint, hint” to the hubby! Hi. I learn the gather trick at “Sewing with Nancy” TV program. I have been using ever since. I do a great amount of sewing for girls in Africa. A campaign I found out about at the local LDS church( I am not a member). It is a great way to gather at a faster and efficient rate. I have a semi industrial Bernina, I learn a great deal from your blog. As far as blog tut goes. I just started a new blog. I am not as good writer as I would like to be. I speak, read and write several languages. Not enough. So far I post pictures. Expert or not I’m glad you shared. I love using my gathering/ruffler foot!!! It’s a godsend and makes it very easy to sew the gathered fabric to the ungathered piece simultaneously . Glad to know someone else feels the same way I do about tutorials!! I’ll continue to blog and throw out tips here and there, but no tutorials at this time. Tutorials seemed like fun until I started putting one together. Ugh! WAY too much like my job (wherein I do computer software documentation and training materials with a zillion screenshots.) I have a blog that is rarely updated as I’d rather sew than look at a computer screen AGAIN. 🙂 Thanks for the tip! I wish Viking had one of those cool little foot holding gizmos. When gathering, I reluctantly do 3 rows of stitching because, miraculously, it looks better than 1 or 2 rows. See http://www.coletterie.com/tutorials-tips-tricks/colette-sewing-handbook-gathering-stitches for more evidence. I have a Janome foot specifically for gathering, you tighten the tension and it works kind of voodoo magic, except the gathers look like crap and the thread can break, so I’m not a fan. If I have yardage that needs gathering but without needing to hit some magic ratio (ie, i’m not gathering a skirt piece to fit into a waistband), I pull out the ruffler. Works like a charm every time. The only caveat I’ve discovered for that piece is that the speed of sewing seems to affect the amount of gathering. Strange but true, so I just set a speed and then “floor” it so there’s no variability there. I’m still bumming about not being allowed the sale price for the invisible zipper foot for my 830 last month. (So I decided not to buy it.) You’ll have to let us know how awesome it is. 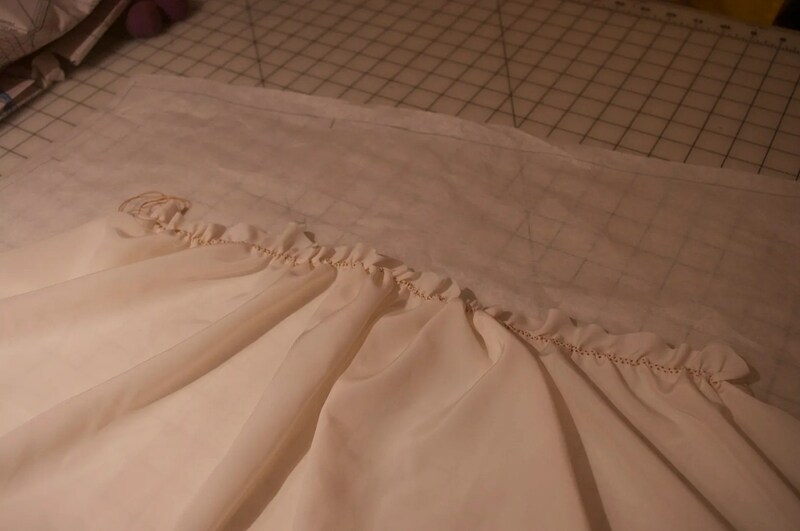 I teach several ways to gather, and the zig-zag over a heavier thread is our go-to method for long pieces, like skirt ruffles, or heavy fabric, like upholstery (we use some surgical cotton thread that was in our stock when I got here (no I don’t know why we have it) or heavy duty dental floss). It’s a great technique! For lighter fabrics I always have them do two rows of gathering. I find beginning sewers are still learning to control the fabric and the two rows are easier to control… they lay flatter it seems. We do use the ruffler foot sometimes too… but it doesn’t seem to like every fabric. Such a shame about the bashers. I wish there was a way to deal with that… but I don’t think there is unfortunately. I see it everywhere… sewing, science, decorating… it doesn’t matter the topic, someone’ going to be obnoxious in response. I’ve pretty much stopped reading comments altogether on the blogs/sites I visit. Life’s too short for that kind of ugly. Jordan’s jacket looks AMAZING! Love the green silk skirt made from the dress of six years ago. (Yes, I’m making all comments in one place) I need to know what pattern is that seersucker dress, please? Love it.